The Democrat spoke at the Know Your Value conference about confidence, whether she will run for president in 2020, George H.W. Bush's legacy and more. As one of the most outspoken members of the Senate, who has built a reputation for her fierce and uncompromising attitude during congressional hearings, there’s no doubt Sen. Kamala Harris doesn't lack confidence. And she attributes much of that confidence to her mother, an immigrant from India who came to the U.S. with dreams of becoming a scientist. When the Democratic legislator was a young girl growing up in Oakland, Calif., she and her sister often spent afternoons and weekends at her mother’s endocrinology lab. Harris said her mother’s example and deep belief that she and her sister could be anything they wanted to be fueled her rise to become the first elected female district attorney of San Francisco and the first Indian-American senator. Harris, whose father is Jamaican, also spoke about how she faced discrimination as a child — something that has influenced her fight against intolerance and injustice in Washington D.C.
Harris acknowledged that her reputation as being outspoken and persistent on Capitol Hill has resulted in her critics branding her as “hysterical.” But Harris told Brzezinski those reactions come from people who mistakenly believe ambitious women are flawed. At several points in the conversation, Brzezinski probed Harris about one of the biggest questions around her political ambitions: Whether she will run for president in 2020. Harris confirmed she is still considering her options, though is close to deciding whether or not she will actually throw her hat into the ring. Harris said she is keenly aware of the challenges a barrier-breaking campaign will entail. 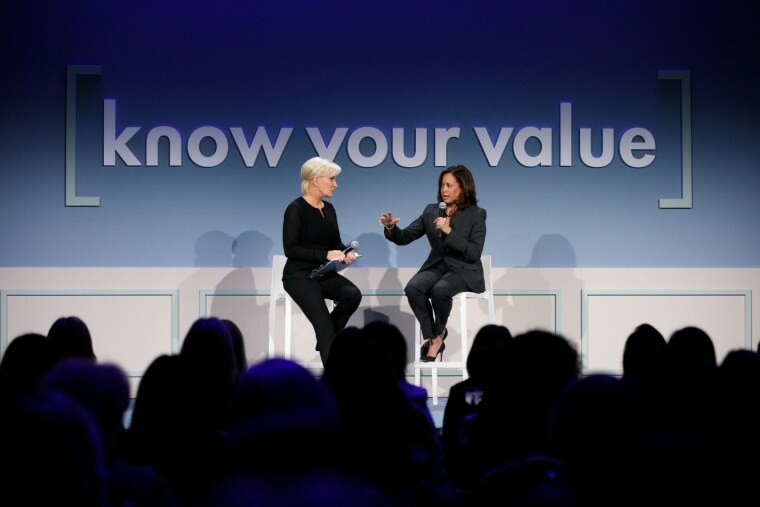 As she contemplates a presidential bid, Harris has been working on a bipartisan effort to ensure elections are fair and free from interference by foreign governments and others who might threaten the U.S. democratic process. The Secure Elections Act, which she introduced in March along with co-sponsor Republican Sen. James Lankford of Oklahoma, would give the Department of Homeland Security responsibility for ensuring secure elections and shoring up election infrastructure against cyberattacks. It would also establish an independent advisory panel of experts to develop guidelines on election cybersecurity. Senate Majority Leader Mitch McConnell has not yet brought the bipartisan legislation to the floor for a vote. Harris said she has been told that is at the White House’s request. Though Harris expressed frustration about the slow progress of that bill, she also said she has hope in the strength of the four legs of democracy, which she noted include the three branches of government and a free and independent press. Harris also weighed in on the legacy of former President George H.W. Bush, who died Friday at 94 and said there are several lessons Washington could learn from him.